Easter is such a fun holiday for the age my kid’s are at. My five & three year old love reading books about Easter, what the holiday is about, and of course, the Easter Bunny. Growing up, I remember the joy and excitement when opening my Easter Basket. There was always a bag of jelly beans, a chocolate Easter bunny, and other fun things like coloring books, crayons, or a fun bow for my hair. Then we would go to the backyard and hunt for Easter eggs. Some were eggshells that we dyed with fun colors and others were plastic eggs to open with usually more candy. With so many holidays centered around candy, I like to focus more on activity and non-food focused treats. 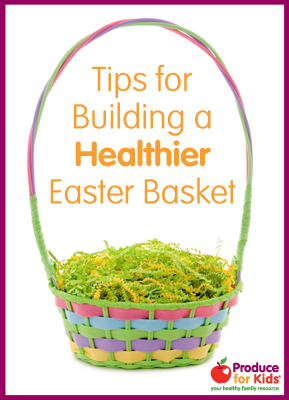 For tips of building a Healthier Easter Baskets, head over to Produce for Kid’s for my latest article.